While browsing the archives I came across this post from way back in December 2005. This time of year exacerbates dark nights for many people, and whatever light we can find can be a blessing. I recall the person mentioned in this entry's story and how critical visits and human connection were for her by this point in her life. So may it be for many of us. Lately I've been encountering a couple references to the 'Dark Night of the Soul,' a phrase coined by St. John of the Cross in reference to the moment one has of doubt...not just doubt, but they find their faith crushed by any number of factors. The Preacher talks about his Dark Night of the Soul in his book. I described mine a while ago. Thinking more about my own I might call it a Dark Year of the Soul, or perhaps the Dark Year that led to the Dark Night. The term is flexible. No one comes to their Dark Night suddenly. Life is not rosy one day and rocky the next. Things pile up and weigh one down: a death, the nightly news, experiences with less than loving Christians, questions about the Bible, illness...the questions start to come more rapid-fire: 'What kind of God would allow this?' 'Why didn't my prayer work?' 'Why does the church act the way it does?' 'Why do people act the way they do?' 'If miracles happened in the Bible, why won't one happen for Aunt Gina?' Before one can really prepare for it, the heart crumbles. One has to be reminded of the rosary's usefulness. If I talk to God, how do I know that ANYONE is really listening? No amount of pithy phrases is going to make me feel better while I watch Dan wasting away from AIDS. When walking into a Christian bookstore, ever feel like you just stepped into Munchkin Land? Everything is lollypops and Dorothy always finds her way home. 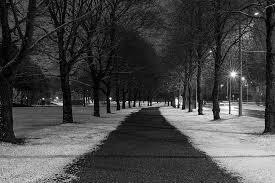 Step back onto the cold grey street and wonder where you just landed. I sat with an older woman this past week. She'd been uprooted from everything familiar and now resides in the Alzheimer's unit of a local institution. The walls are a drab green. Pictures of relatives on a corkboard remind her of who loves her but she'd rather they visit more often. She's got a cot, a TV, and a blanket. Everything else is for the family to divide. Every day is 'hell.' She sleeps because she's bored. I sat there while she caressed my hand, thankful for a familiar touch. One might expect her Dark Night any time. Yet what she holds onto most dearly is the thought of her church. She's still driven to worship on Sunday and loves communion. 'It's when I feel closest to the Lord,' she says with that yearning piety in her eyes you can only see to properly understand. She glowed the day her adult son was baptized. She misses her Sunday School class. Maybe her Dark Night came and went a while ago. We're probably allowed more than one, but her faith is as strong as it's ever been in the face of loneliness and despair. In a few weeks we'll read about the light shining in the darkness and the darkness not being able to overcome it. It reminds me of when I lived in my apartment at Eden, where we had gas stoves. I'd go out to the kitchen at night to get a drink and notice the soft blue of the pilot lights just underneath the stovetop. I can't explain why, but I was comforted by seeing those little flames. It's trouble when one of those things go out, but I just enjoyed watching them. The light shines in the darkness, ever so small, always with the potential to grow bigger. For my parishioner, she's at least got the pilot lit. I think it's bigger than that. She itches for each Sunday to come around. It means she'll leave her cold drab walls and fall back into the embrace of a community that gets that flame going. The greatest of these is love. Little else makes sense to me during the dark times. It's why I could only tell certain people about mine, lest I be met with a handful of Bible verses and a lollypop from the bookstore. That Paul names love above faith has been blowing my mind for a couple months now. I can't fully get my mind around that one yet. So if loving others or experiencing love is greater than having all the faith in the world, it'd be energy better spent to keep vigil during one's Dark Night instead of trying to ignite the blowtorch.